Summer has come and gone and it’s back to school again for the fall semester. The traffic around town is picking up speed as parents and teachers rush to prepare for the challenge of educating their young. 2009 will go down as one of the most testing years in terms of the economy. Just to give you an idea, in some cases it will take a month’s salary of both parents just to cover the costs of sending their kids back to class. The number of households who will simply not be able to afford that expense is at an all-time high. There have been many cutbacks in school personnel and budgets as well. Toward the close of last semester, Miriam was left hanging without a job. The private elementary school where she had been teaching was faced with the decision of either cutting back or closing its doors. Then the opportunity came up to take the teacher’s test to enter into the public school system. The government pays better and there are far more benefits. However, only 600 out 6,000 teachers would find job placement regardless of the results of the test. As you can tell, the selection process is less than fair. Only God knows if she will make it in. God is good! Miriam received a call from the private school where she had been working and they want her back for another year. That’s wonderful news and the Lord knows that we need that extra income to pay for our own kid’s education. My daughter Kimberly will not be receiving a full scholarship like last year, but at least she will get a 50% discount. Neftalí’s education is our greatest investment. He still has at least a couple of semesters to go before he graduates as an engineer. As announced in an earlier update, the next step in ministry here is to train leadership for ministry. Sometimes I wonder if all the mission work that has gone on in Mexico for so many years has had a significant impact. Most of our churches in the country are rather small, usually with less than 100 members. Only a few top that number. Colleges and institutes have generally failed to produce the quantity and quality of leadership required to meet the growing needs of existing churches, much less the demand for new churches. So far, all of these educational institutions have been located on the eastern side or in the interior of Mexico, way out of reach for most of our membership in northwest (Baja California, Baja California Sur, Sonora and Sinaloa). Somehow, we need to come up with a new plan and fast. The non-instrument Churches of Christ have come up with some novel approaches in the last few years that have begun to show some promise. We could probably learn something from them. Unencumbered by the trappings of traditional higher education, they have implanted a variety of programs directed toward the busy working adult who wants to get involved in ministry. A lot of this material can be found on the Internet, usually in a guided learning format. For example, the Instituto Biblico del Golfo located in Florida is at the forefront of this push to make college-level courses readily available. I have been told that they are working in collaboration with Sunset International Bible Institute to provide an on-line classroom experience for the increasing number of Spanish-speaking students worldwide. It’s quite an undertaking. Other options that exist are Cursos Bíblicos para Obreros Cristianos by my fellow missionary colleague Larry White, the Hispanic Department of Brown Trail School of Preaching under the guidance of brother Willie Alvarenga and the Escuela Quiteña de Estudios Bíblicos located in Ecuador. I’m sure there are more, but this is a pretty good sampling of what is being offered. We must move now if we are going to train the next generation of churches leaders for the increasing challenges the lie ahead of us. This following semester will play a crucial role in the months and years to come. If God still has a plan for our family’s involvement in the work here, we need to hear from you right away! I suppose that I don’t need to remind you of the uncertain times that we are living in. The economic meltdown, the loss of individual freedoms, and the increasing restrictions on movement have made even the most basic movement unmanageable. There is growing concern among the missionary community for the future of world evangelism. Even so, we continue to plow forward as best we can. Since I still have young children who are dependent on my care for them, I have given some consideration to other options for a steady income. I have appealed to our supporters and friends who are living in the southwestern U.S. to help us secure a ministry among Hispanics in this area. A few of the possibilities have been L.A., San Jose, Salinas, Bullhead City, Phoenix and Yuma. Nothing has come up so far. One good brother in Tampa, Florida offered his church building there to host a Hispanic group, but that is clear over on the other side of the continent. The latest development has been an invitation to work with a bilingual group in Chicago – another far off place. It seems that the only options for full-time ministry in the U.S. are all on the other side of the country. Although a few of my friends have encouraged me to accept the invitation, to do so would pull me away from any significant involvement with the ongoing work in Mexico – my “first love.” I need some serious direction from the Lord. Please pray for us as we struggle through this phase of our lives. We’re sure not getting any younger with time. Lately, I have been experiencing some of my first signs of aging, namely broken teeth (always a nightmare), loss of good eyesight, and some minor loss of hearing. I think that most of these symptoms could probably be reversed to some degree with proper care. We live in area with high contamination levels: noise, cement dust, smog, etc. I will need to get some extensive dental work done soon and a new pair of glasses soon. Please pray that these needs would be met somehow. THE FINAL PAYMENT ON THE HOUSE PROPERTY IS DUE IN DECEMBER! The owner of the house that we are living in (next-door to the church property) called me earlier this month to notify me of the upcoming deadline in December for the last balloon payment of $30,000. There is no way that we can afford it at this time, so it’s going to take a mega-miracle to meet that need. Maybe someone could come up with a loan or something. I am confident that we might be able to negotiate an extension, if we can at least cover the half of that amount. He knows that the situation of the economy is not good, so I am trusting in the Lord to guide us both. Family camp in Ensenada was a huge success this year. We were expecting around 25 to 35 campers, but our total attendance was 45. It only lasted a couple of days, but everyone had a blast. There were several youngsters that came this year and that is encouraging. There was more of a team effort this year. Even those who have not attended in the past had a pretty good idea of what they should do, even without much oversight on our part. I presented a series of lessons on the full amour of God and an evangelistic message on Saturday and Sunday. There were not decisions made at this time, but the seed was sown and lives were enriched by the Bible teaching. Everyone that I have talked to after camp have expressed their satisfaction with result. Truly God has strengthened us all. “Where are we going to go to celebrate our Easter church weekend retreat?” That was the question on everyone’s mind after we were informed that the campground that we usually rent had suddenly raised its rates 30% in comparison to last year. The number of adequate and cost-effective options for church camps is shrinking in our area. The mere cost of maintaining these facilities can sometimes be prohibitive, and some Christian groups are finding it nearly impossible to manage their own campsites. Nevertheless, as the number of believers continues to grow the demand for these retreat centers increases. Normally this would be a positive sign, but under the current depressed economy few families are able to afford it. With the date for the Easter retreat less than a month away, the Colonia Jalisco church began to pray for the Lord’s guidance in finding an alternative site. Miriam and I approached the leadership of the Ejido Erendira congregation with the idea of holding our event at there “mission center”, where they house visiting groups and teams that come down to do community work. This facility has two dorms, a central kitchen, and two classrooms that can also be used as dorms. We were informed that the Erendira and Bonfil churches had already reserved those dates for their own annual gathering, and that our request would have to be cleared with them first. As the clock ticked away mercilessly, our congregation continued to pray and wait for a response. The Lord answered our prayers, and we were invited to share in the program. Miriam and I helped with some of the teaching. This would be the very first time that the three churches would gather together to celebrate the Lord’s resurrection and enjoy each other’s fellowship. It proved to be a godsend for us. Praise the Lord! Our hosts were generous and cooperative, making our job as organizers and coordinators that much easier. There were a few snags, but overall it turned out to be a wonderful blessing. The kids enjoyed it the most of course. The adults and the youth also participated in the various activities planned for them. On Saturday, all of us went down to the beach and celebrated 7 baptisms – 6 from Bonfil and one from Ensenada. Now that summer is just around the corner, the search for another campground is on. We will be looking at several options in hope of finding something that will work for us. Please keep this matter in constant and fervent prayer. Thankfully, we have three male teachers in the church now that can help with the adult and youth classes: Neftali, Ellery, and I. There are several women in the church that will be in charge of the children’s classes. All we need is a location and food items. A friend of mine who has been helping me with a recording project, lost absolutely everything when his house located near the center of town went down in flames recently. He is married and has two children (a son and a daughter). He has also been diagnosed with diabetes and high cholesterol. His current income is less than $80 a week – barely enough to keep food on the table. All that was left was a small unfinished storage room that they have been living in. Moved to compassion, my wife and I decided to make an older house trailer available to them. It needs a little TLC and the rain water seeps through one of the front seams, but it is fully equipped and is serving their urgent need just fine. During a recent visit, I was delighted to learn that they are being blessed by this additional living space. My friend is struggling with health issues, probably related to the resulting stress. His vision has been impaired somewhat, so please do keep him in your daily prayers. The annual Christmas Service and Dinner, is one of the most important outreach events that the Colonia Jalisco congregation offers to family, friends, and acquaintances. The program usually consists of uplifting seasonal praises, special music and a Christ-centered message. The children prepare and perform their plays and/ or skits to help drive home the message about the incarnation of the Messiah Jesus. It is a time of sowing the Gospel seed among seekers that sometimes produces a harvest of souls during the following months. We usually enjoy a pretty good turnout, and this year was no exception. I counted between 70 and 80 people. Another conservative estimate was between 65 and 70. It’s not easy to keep an accurate count because there are always people coming and going throughout the duration of the program. This year my sister Cynthia helped to sponsor the event, so we were able to offer a delicious hot meal to our invited guests as a tangible expression of our Christian love toward them. Other church members helped with the food preparation and service. Over the years, I have heard a few arguments against the practice of “celebrating Christmas”, and I am sure that they are probably valid to some degree. However, I have found that the best time to present the message of salvation is when people are most sensitive and open to listen. Many of those who come to this yearly occasion would never darken the door of a church building otherwise. For them, this will be the first time that they will have heard the Biblical message of redemption through the all-sufficient sacrifice of the Son of God. We want to be there with the answers to their spiritual questions when they are ready to receive them. Another very good reason to celebrate the birth of our Lord during this season is the children. For the most part, Mexican children don’t receive much of anything on Christmas, so it gives us a perfect opportunity to exhibit God’s eternal love for them through the tangible acts of love displayed by His people. It is much easier for a child to make that connection in his or her mind than adults, as theirs is the kingdom of heaven. One of the greatest challenges for the church in Mexico is a good solid educational program to ground believers in the word of God and train them for ministry. There is a huge deficit in preachers, elders, and teachers that a traditional academic model will not even begin to address. The time has finally come for the RESTORATION of the Biblical approach to theological and ministerial training! A Biblical training program does not need to be substandard. In fact, it can be more demanding than an on-campus approach, depending on the particular requirements of a growing community of believers. But one of the greatest virtues of an in-house paradigm is that it can be made flexible enough to address the real needs of those who will be ministering to others. Another benefit is that it restores the church as the saving community that God has always intended it to be. As the present economic crisis continues to worsen, it will soon become the only viable solution for the church. We can choose to regroup and retool now while conditions are still in our favor, or we will be eventually forced to do it later under dire straits. It’s our choice to make. I realize that a prophet is not without honor except in his own country and in his own house. (Mat 13:57) A few years ago, no one really believed that this economic meltdown was coming or that it would last as long as it is going to last. As recent as the GOP race for the nomination, Ron Paul was pretty much the laughing stock of all of his competitors in his own political party. I don’t think anyone is laughing now. I am not a politician or an expert in economy, so in 2004 God had to communicate this same message to me the only way he could: through the language of his Spirit, who indwells every true born-again believer in Christ. I issued a warning to the church to the effect that God was getting ready to poor out His judgment on a wayward nation, and no one paid much attention then. I suppose that it’s merely human nature to ignore the warning signs. Maybe they will heed the call to restore the church back to its New Testament paradigm now. What began as an evangelistic campaign rapidly turned into a unity and restoration meeting, as nearly all the local churches were represented there. The Lord did crown the event with one baptism toward the end, and there are three more on the way. On Saturday night we had a special time of prayer for the sick, and at least 20 people walked up to the front for that. We had the preachers and elders of all the churches come forward to pray for them. It was great to see the church ministering together for the common good of the needy. On Sunday night, Tito prayed for the local leadership and asked the church members to join him in intercession for these men. We also celebrated the Lord’s Supper in unison together. It was probably one of the most symbolic and touching moments of the entire program. Each congregation was able to embrace all of the other congregations as part of the body of Christ. What a precious time of healing this turned out to be! There are many lessons learned from this brief but substantial experience. My job was to coordinate the entire event and make sure that all of the needs of our evangelist were cared for. The sister church from Granjas El Gallo was in charge of the children’s program and the meals for the visiting team. They did an excellent job! Ruben, Elery, and Neftali presided over the evening program. Our members were in charge of preparing the final evening meal for Sunday night and clean up chores. Both the Empleados and Lomitas churches brought special music. The synergy created by the combined efforts of everyone working together surpassed even my expectations. It makes me wonder what could be done if we decided to form a city-wide team for prayer, evangelism, leadership-training, etc. There is certainly a lot of work to be done in the days ahead, but we must decide now if we will do it in unity or continue on our separate ways. Everyone is asking me “what comes next?” I tell them that it’s up to them to decide. Brother Mark Northrup came and preached a message of forgiveness and reconciliation. Tito Garcia came and shared God’s call to church unity. It is only proper that some of the other leaders shoulder part of the responsibility and show some initiative. And I think they will too, possibly even sooner than expected. Ruben has already requested to meet with me for ongoing dialogue in order to set some dates for further discussion among all the preachers and elders. Personally, I intend to move full-steam ahead and form a solid team with all of those who have captured that vision and want to work together for the Lord. At this time, there are several candidates that have expressed their desire to do exactly that. During our private conversations, brother Tito said something to me that has stuck in my mind. He told me that “unless God moves you to somewhere else, you better stay put where you are.” He was speaking of himself and his own ministry in Tijuana, but it was God’s way of confirming something that I have been praying for. About a week or so before the campaign, I had asked God to please show me a sign or give me some direction as to what I should do with my life. After all, I have asked and prayed many times for a ministry opening someplace else, even in the U.S. During the campaign it became increasingly clear to me that God wants me to remain right where I am now. He has undeniably confirmed my leadership role among the churches in Ensenada, and he has shown me that there is a huge task for me ahead in training a new generation of servant leaders for His church in Mexico. Another important lesson learned is that we will need to find someplace else to hold our meetings very soon. Growth is forcing us to face reality, and our little facility is just not capable of dealing with larger crowds. An ideal solution would be to find a large plot of ground on which to start building. That way we would not have to face the monthly rent fees. However, the pressing need would probably require some transitional or intermediate solution as the Lord leads. Miriam, Santiago and I have been fighting off cold and flu symptoms for several months now. Kimberly has had tonsil infections twice already, and now her digestive system is suffering the consequences. Miriam has developed a chronic laryngitis that doesn’t want to clear up. I started having bronchial congestion almost five months ago, and now it has moved back into my sinuses. We just can’t seem to lick this thing. We need a miracle! I have been watching the Spanish version of CBN called “MundoCristiano,” and they had featured a news clip documenting the effect that the financial collapse is having on the U.S. missionaries around the world. It has been reported that missionaries have lost between 35% and 50% of their income and purchasing power, forcing many of them to downsize and even leave the mission field. It is not a pretty sight any way you look at it. Please pray for our future in ministry. 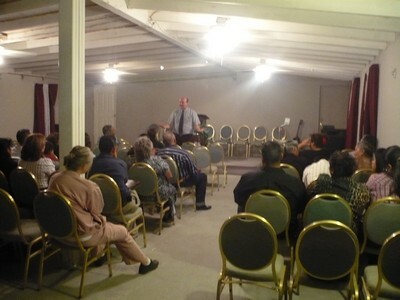 November 16 of 2008 will undoubtedly be remembered as an historic occasion for the local churches in Ensenada. 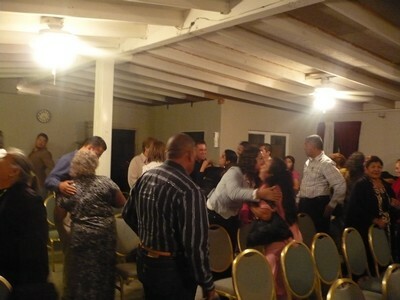 A series of protracted unity meetings have been held over the weekend at several different locations and the Colonia Jalisco church was the last to host the well-attended group of visitors. Members from 5 out of the 7 congregations were present to enjoy some uplifting worship and the rich fellowship of the saints. Jesus Christ is doing a sovereign work among his people, and he is reclaiming his bride for himself. Mark Northrup, a fellow missionary colleague from Saltillo, Coahuila has been touring through the state of northern Baja and delivering a message entitled “Healing for a Bitter Heart.” He has shared his own difficult pilgrimage from bitterness to wholeness and many have responded to his call for mutual forgiveness. Many times God uses different agents to issue a wake-up call to his body, especially to those who are in a position of leadership. I have found that average church members hunger for unity, but it is the leadership that oftentimes gets in the way. Strong personalities and firmly-held convictions can clash with each other, causing friction among the brethren. But even when those issues are resolved to everyone’s satisfaction, there can be significant doctrinal and even moral concerns that obstruct unity efforts. This has been our struggle in Baja for at least two decades. A fresh message of forgiveness and healing of old wounds at least holds out the prospect of eventually overcoming these obstacles and moving forward. The next step in procuring fellowship among local congregations will be to get the leaders to meet with each other for the purpose of mutual encouragement and planning. This phase will be absolutely crucial if a lasting unity is to be obtained. There is already a move toward unity among the churches at a regional level, so it behooves us to give our best effort to finding a resolution to our local differences. This will not be an easy task, as some issues remain firmly entrenched. Nevertheless, we are praying that God would sovereignly remove all these impediments in his perfect timing. In the midst of this process, the Lord has been blessing us with his favor and has been vindicating our ministry in many ways. We are humbled by the many displays of love and respect that we have been getting from a growing number of our brothers and sisters throughout the region. This favor has been confirmed by brother Tito Garcia, who is the acting chairman for the regional minister’s meeting. He has embraced us as fellow servants and worthy ministers of the Gospel. Tito Garcia, the fellow evangelist for the Colonia Periferico church in Tijuana and the, will be holding an evangelistic campaign at our church from December 4-7. His wife Eunice will be doing the special music, along with their worship team. They are a delightful couple and a true blessing to the church. We look forward to their visit with us. The congregation at Granjas El Gallo will be working with us in this event. They will be in charge of the children’s program.